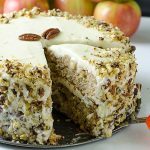 Apple Sheet Cake – super moist and delicious! 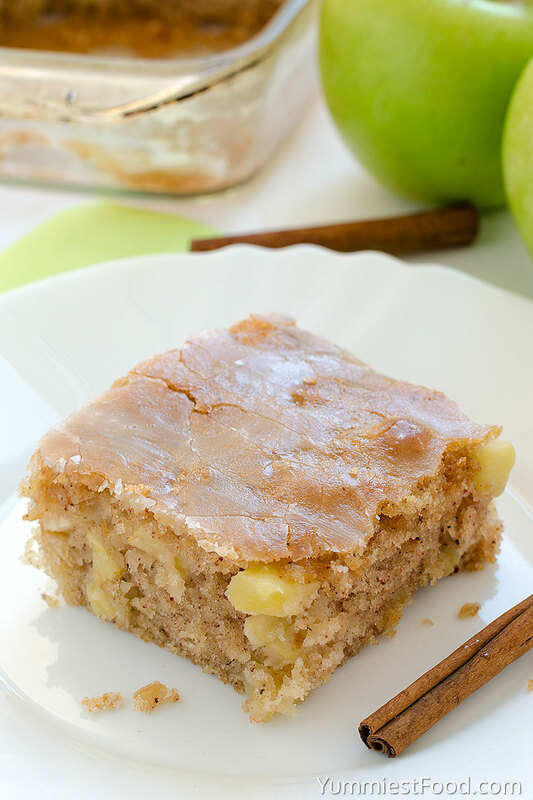 This Apple Sheet Cake is made with fresh apples and only few ingredients! Very quick and easy so you need to give a try! Here comes the end of summer and all of us who have children are preparing for school again. But we need to find time to try something sweet and refreshing. Apple cakes are the best choice for me and apples are the favorite fruit in my family. When I am thinking of the end of summer I always thought on apples. 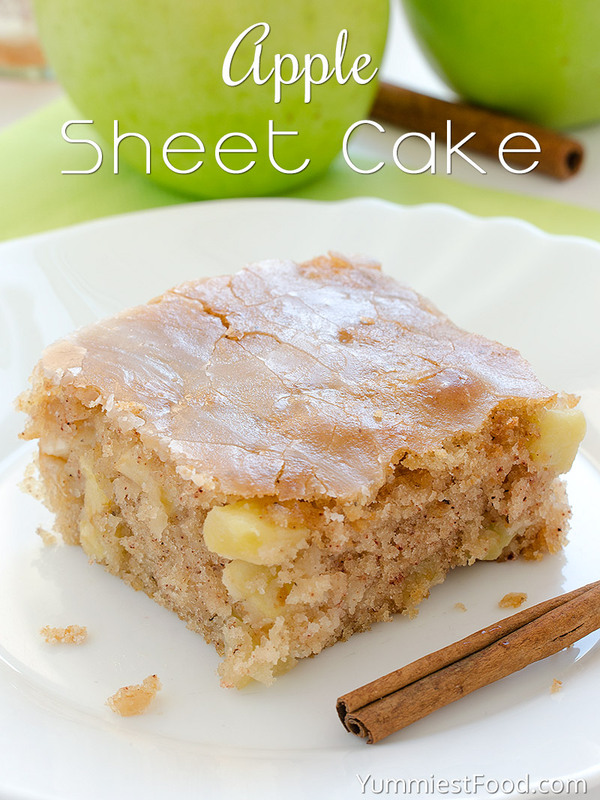 Apple Sheet Cake is very quick and easy to make. The longest thing for preparing this Apple Sheet Cake is when you need to cut out the apples and when you finish it your Apple Sheet Cake is almost done. I love this period of year when my kitchen is full of amazing smells. Apple the queen of autumn gives to my kitchen some interesting mining. Because of that the choice for today is Apple Sheet Cake. You just need to mix all the ingredients add the mixture in the loaf pan and your cake is done. This Apple Sheet Cake is favorite in my family and my children eat it immediately. Very important is that your Apple Sheet Cake will be moist and nice even tomorrow. I recommend this Apple Sheet Cake to everyone because it is very easy to make and you have all the ingredients in your kitchen. Apple Sheet Cake is sweet, but not too much. Rich apple flavor perfect for these late summer days. 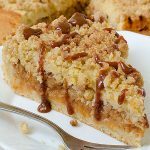 I made this recipe so many times and I can say that this Apple Sheet Cake is perfect combination with a cup of coffee. 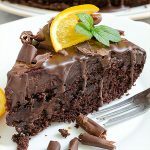 This is my favorite quick cake when my friends come over. I like apples very much, so I have them very often in my kitchen. Apples are right choice for many recipes and they are very good for combination. 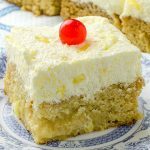 I really like this Apple Sheet Cake which is very delicious, quick and easy to make with only few ingredients. The simplest things are the best! If you want to make something easy, quick and delicious you are on the right way – Apple Sheet Cake! Enjoy! Apple Sheet Cake - super moist and delicious! 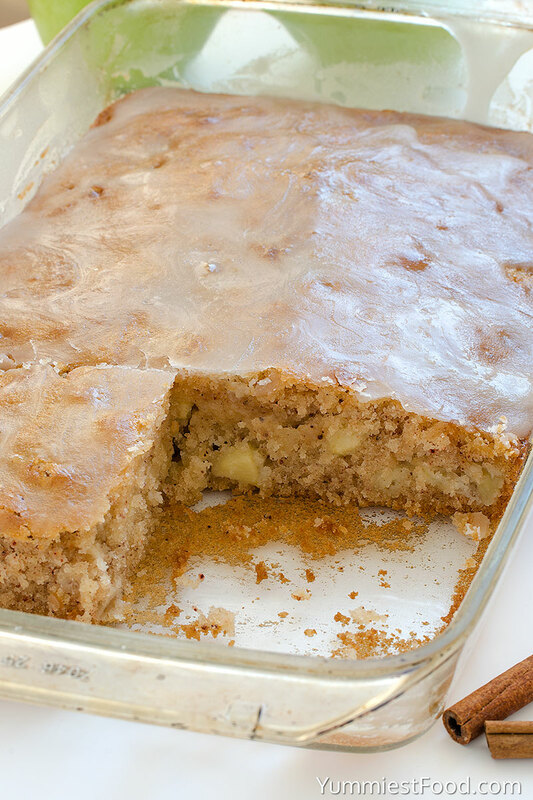 This Apple Sheet Cake is made with fresh apples and only few ingredients! Very quick and easy so you need to give a try! In a saucepan, combine powdered sugar, vanilla extract and water. Cook over medium heat, stirring constantly, until the mixture boils. Boil without stirring for 2 minutes, remove from heat and spread over the top of the cake. Hello. My name is Katherine O. I just made this cake today and it didn’t come out at high and fluffy as shown in the photos. The cake came out a flat, sort of like a large apple cake bar. I’m not sure if it has to do with my oven or the way I mixed the ingredients but I did everything in this recipe. The only thing I did differently is add only 3/4 cup of butter instead of a full cup. I thought that was a lot of butter. Any suggestions? It takes pretty good but I’m just concerned with why it didn’t grow much. Thank you. Hi Katherine, try to follow the instructions from the recipe. Good luck! 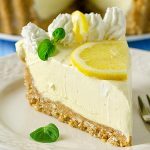 It may be either your baking agent is old or damp (in which case it cannot rise such a wet mix) or you overmixed the wet into dry, in which case try only folding in (not whisking) so dry is just mixed through. It can even be a little lumpy looking when pouring into the pan. This cake is unbelievable! I lost the recipe, but am delighted to find it again! 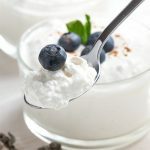 How do you cream the ingredients with the chopped apples in there? I had batter flying everywhere! Hi Barbara, How strange! That definitely didn’t happen to me, but try to wet ingredients gently stir in the apples. Please let me know how it turns out for you 🙂 Hope that helps! I fold the apples in at the end with a spatula. That’s just how my mom taught me. It works great! 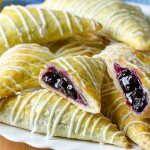 Hi Ekta, I haven’t tried this with regular whole wheat flour. I’m not sure about the texture if you sub all regular whole wheat flour. It might be fine. I think it would still taste good. 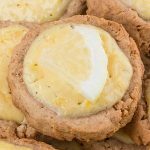 If you cream the butter and sugar together first it helps break up the butter (emulsify), then add the eggs and beat until blended. Next add the buttermilk & water in small portions, alternating with the dry ingredients. When it’s all mixed together, stir in the apples at the end. That’s the best way to approach most sponge cake batters. Was everyone else’s glaze really runny? I did recipe word for word. Hi Wendy, How strange! That definitely didn’t happen to me, but if you encountered this issue then I would definitely wait until the cake is cooler before glazing. I hope that helps. My experience was exactly the same as Wendy’s – glaze is beyond runny, it’s completely liquid. I followed the directions as written. Your directions suggest the glaze should be spreadable, not possible. Hopefully it will taste good. I am expecting guests. Will update my rating after I serve it. Anyone have an opinion/experience on whether or not this cake freezes well? I had to bake my cake longer as well. It turned out more dense than cakey. I wonder if a little less water is used if it would be more like it was pictured. Next time I try this, I would definitely stir in the apples at the end. Cake is good, but recipe needs a lot of tweaks to work. First, you need to cream the butter on its own before adding the other ingredients. Second, the apples need to be gently folded into the batter last. Then the glaze needs to boil waaaay longer to become spreadable. My cake was completely cold and still soaked the glaze all up because the glaze was still too liquid. The cake tastes good, but the instructions could have been better, maybe not giving times for things that are affected by altitude, humidity, oven settings and so on. I think it would have been better if the instructions just told you what to look for instead of how long you should let things go, say… boil the glaze until it reaches spreadable consistency because circumstances vary. I will try to make it again and see if I can get the glaze to work like in the picture. I agree about the cooking time…took twice as long as the recipe stated…..